Jeffrey Guy Conine (/ˈkoʊnaɪn/; born June 27, 1966) is a former Major League Baseball player who played 17 seasons with six teams primarily as an outfielder. An inaugural member of the Florida Marlins who was with the franchise for both of its World Series titles, he earned the title Mr. Marlin for his significant history with the club, and his ties to South Florida. Conine was born in Tacoma, Washington, played baseball at UCLA, and was drafted in the 58th round of the 1987 Major League Baseball draft by the Kansas City Royals. After two cup of coffee stints with the Royals, Conine selected by the Marlins in the 1992 Major League Baseball expansion draft. Becoming the team's first star, he played five seasons with the Marlins, earning the most valuable player award at the 1995 Major League Baseball All-Star Game and earning a World Series title in 1997. A victim of a fire sale after the 1997 season, Conine was traded to the Royals where he played in 93 games. He was traded to the Baltimore Orioles prior to the 1999 season, where he had several productive seasons. Traded back to the Marlins in 2003 for a couple of prospects, he helped the team win a second World Series title. He remained with the team until 2005, returning to the Orioles as a free agent. He became a journeyman outfielder near the end of his career, signing a one-day contract to retire as a member of the Marlins in 2008. Conine played college baseball at UCLA, where he was originally a relief pitcher. In the summer of 1986, he won a Cape Cod Baseball League title with the Orleans Cardinals. He was drafted by the Kansas City Royals in the 58th round of the 1987 Major League Baseball draft as a first baseman. Prior to the draft, Conine was considered a mediocre pitching prospect with a high earned run average and a "decent" slider. He only had one at-bat as a member of the Bruins, but he was hit by a pitch. A recommendation by Royals scout and former UCLA pitching coach Guy Hansen led Conine to be drafted, when he told Royals general manager John Schuerholz that the best hitter on UCLA's team "was a pitcher". After three minor league seasons, in which he batted .290 with 39 home runs and 214 runs batted in, he joined the Royals as a September call-up in 1990. He returned to the minors for two more seasons, and learned to play the outfield with the Omaha Royals before returning to the majors late in the 1992 season. Conine was selected by the Florida Marlins in the 1992 Major League Baseball expansion draft, and converted into a full-time left fielder. Though the Marlins narrowly avoided 100 losses, Conine emerged as a star. He went four-for-four in his first game as a Marlin in a 6-3 victory against the Los Angeles Dodgers. Conine played the full 162 game schedule in left field his rookie season. He batted .292 with 12 home runs and 79 RBIs to earn a third-place finish in National League Rookie of the Year balloting. The following season, Conine was batting .313 with thirteen home runs and 64 runs batted in at the All-Star break to earn selection to the NL club. He finished the strike shortened 1994 season with a career high .319 batting average, 18 home runs and 82 RBIs. During the strike, Conine returned to the Marlins' Instructional League affiliate in Brevard County, Florida to learn third base. The experiment never materialized, and Conine returned to left field once play resumed in 1995. He batted .340 with nine home runs and 24 RBIs in June to earn National League Player of the Month honors and his second consecutive All-Star nod. In his only career All-Star game at-bat, he hit a go-ahead pinch hit home run in the eighth inning to receive MVP honors. For the season, he finished fourth in the league with a career high 105 RBIs with a .302 batting average and 25 home runs. In 1996, Conine had 26 home runs, 95 RBIs, and a .293 batting average. Newly hired Marlins manager Jim Leyland shifted Conine back to first base in 1997, as the club had acquired free agent Moisés Alou to play left field. The Marlins finished second to the Atlanta Braves in the National League East by nine games, however, their 92–70 record was enough to secure the National League's wild card play-off spot. After sweeping the San Francisco Giants in the 1997 National League Division Series, the Marlins defeated their division rival Braves in the 1997 National League Championship Series, four games to two. Conine's seventh inning single provided the game-winning RBI in game five of the series. The Marlins beat the Cleveland Indians in a seven-game World Series to break the 1969 New York Mets' record as the youngest expansion franchise to ever win a World Series title. Conine batted .214 with no home runs, three RBIs and five runs scored in his first post season. Immediately after winning the World Series, Marlins owner Wayne Huizenga dismantled his club, claiming financial losses despite having won the World Series. As part of the "fire sale" of his franchise's best players, Conine was shipped back to the Kansas City Royals for minor league pitcher Blaine Mull. At the time of his departure, Conine held the franchise records for hits, RBIs and games played. Chronic back pain limited Conine to 93 games with the Royals in 1998. Following just one season back in Kansas City, the Royals traded him to the Baltimore Orioles for pitcher Chris Fussell. Conine returned healthy, and enjoyed a resurgence with Baltimore, as he batted .291 with 13 home runs and 75 RBIs in 1999. He also appeared in four games at third base for the first time at the major league level. That number increased in 2000 as he became more of a utility player, appearing in 119 games and logging 452 at-bats without a regular starting position. He enjoyed a comeback 2001 season, batting .311 with 97 RBIs, and was rewarded with a starting position back at first base. He batted .287 with 79 home runs and 410 RBIs in five plus seasons in Baltimore. After firing manager Jeff Torborg early in the 2003 season, the Florida Marlins suddenly became one of the hottest teams in baseball under new manager Jack McKeon. Tied with the Philadelphia Phillies for the wild card playoff spot, the Marlins decided to reacquire one of the most popular players in franchise history, sending right-handed pitching prospects Denny Bautista and Don Levinski to Baltimore for Conine. Conine batted .239 with five home runs and fifteen RBIs over 25 games back in Florida, and the Marlins returned to the post-season for the second time in franchise history. Conine's reacquisition truly paid off in the post-season. He batted .458 with three RBIs and a home run in game five of the 2003 National League Championship Series against the Chicago Cubs, and batted .333 in the World Series against the New York Yankees. Conine holds the distinction of being the only player to appear in the opener of the Marlins' inaugural season, the 1997 World Series Marlins' championship team, and the 2003 World Series Marlins' championship team. He remained with the club through the 2005 season. After which, he returned to the Baltimore Orioles via free agency. Though he put up solid numbers through 114 games with the Orioles, at forty years old, Conine was clearly in the twilight of his career. Though the Philadelphia Phillies were 14.5 games back of the New York Mets in the NL East, they were in the thick of the NL's wild-card race. On August 27, 2006, they acquired Conine for cash for a player to be named later (infielder Ángel Chávez) to serve as a right-handed bat off the bench. Though Philadelphia failed to make the playoffs, Conine proved a solid addition, batting .280 with seventeen RBIs in 28 games. When the Phillies signed free-agent Jayson Werth after the season, Conine became expendable, and was sent to the Cincinnati Reds for minor league prospects Bradley Key and Javon Moran. Platooning with Scott Hatteberg at first base, Conine batted .265 with six home runs and 32 RBIs over eighty games. More importantly, his .409 batting average and four RBIs in 22 pinch hit at-bats made him an attractive player to the New York Mets, who were looking to add depth to their bench. On August 20, 2007, Conine was traded to the Mets for minor leaguers Sean Henry and Jose Castro. Though he hit an RBI single in his first at-bat as a Met, he proved less successful in that role with the Mets, batting just .195 over 21 games with his new club. On September 20, Conine announced that he was considering retirement before his final series in South Florida. He played his final game on September 30 against the Marlins, replacing an injured Carlos Delgado at first base. On March 16, 2008, Conine agreed to a one-day contract with the Florida Marlins, which he signed on March 28, 2008. The Marlins held a tribute to Conine before their home opener against the Mets on March 31. He batted .290 over his career with the Marlins with 120 home runs and 553 RBIs. He still holds the franchise mark for grand slam home runs with six. On November 28, 2012 Jeff debuted on the BBWAA 37-player ballot as a candidate for enshrinement to the Baseball Hall of Fame with service years of 1990, 1992–2007. Jeff Conine broadcasting live during a post-game Fox Sports show. Shortly after retiring from baseball, Conine began competing in triathlons. On December 26, 2007, while training for the Ford Ironman World Championship in Kona, Hawaii, he crashed his bicycle while trying to avoid a car pulling out in front of him, and shattered his collarbone. Though sidelined for two months by the accident, he still managed to compete in the Ironman as well as the St. Anthony's 32 mile Olympic-style race in St. Petersburg, Florida, the half Ironman at Disney and the Timberman 70.3 in New Hampshire. Conine appeared as a color commentator on three Florida Marlins Fox Sports Net telecasts, September 19–September 21, 2008, filling in for Tommy Hutton. He currently is the co-host of Marlins pre-game and post-game shows for home games, and works in the Marlins' front office as a special assistant to the team president, David Samson. On April 29, 2014, Conine was inducted into the Ride of Fame in Miami and a double decker tour bus was dedicated to him and his vast career. A racquetball enthusiast who won an amateur title when he was eighteen years old, Conine met his wife Cindy at a professional racquetball tournament in New York City. They have three children. Griffin, his son, has recently committed to play baseball at Duke University  and was drafted by the Marlins in the 31st round of the 2015 MLB draft. ↑ "Players won't miss Marlins' old home". ESPN. Associated Press. September 26, 2011. Retrieved 9 April 2014. ↑ "Memphis' Conine Top Prospect". Gadsden Times. Associated Press. July 4, 1990. ↑ "Florida Marlins 6, Los Angeles Dodgers 3". Baseball-Reference.com. April 5, 1993. 1 2 3 4 5 6 7 8 9 "Jeff Conine Statistics and History". Baseball Reference. Sports Reference LLC. Retrieved 9 April 2014. ↑ Steve Wine (September 21, 1994). "Conine To Try Glove at 3rd". The Boca Raton News. ↑ "1995 Major League Baseball All-Star Game". Baseball-Reference.com. July 11, 1995. ↑ "1997 National League Division Series". Baseball-Reference.com. September 30 – October 3, 1997. ↑ "1997 National League Championship Series, Game Five". Baseball-Reference.com. October 12, 1997. ↑ "Marlins Send Conine to Kansas City". Spartanburg Herald-Journal. November 21, 1997. 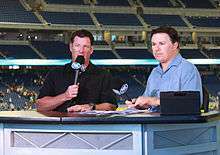 ↑ "Safe at home: Conine suits up with Marlins for first time since '97 World Series". Sports Illustrated. September 1, 2003. Retrieved September 19, 2013. ↑ "2003 National League Championship Series, Game Five". Baseball-Reference.com. October 12, 2003. ↑ Ken Mandel (August 27, 2006). "Phils bolster bench, acquire Conine". MLB.com. ↑ "Phillies Peddle Jeff Conine to Reds". CBC Sports. December 21, 2006. ↑ Marty Noble (August 20, 2007). "Mets acquire Conine in trade with Reds". MLB.com. ↑ "San Diego Padres 7, New York Mets 5". Baseball-Reference.com. August 22, 2007. ↑ Joe Frisaro (March 16, 2008). "Conine to retire a Marlin". MLB.com. ↑ "Big Names, Biggest Honor, 2013 BBWAA Hall of Fame election results announced Jan. 9 By Craig Muder". National Baseball Hall of Fame and Museum. November 27, 2012. ↑ Don Norcross (October 8, 2008). "Ex-major leaguer Conine takes an Ironman swing". U-T San Diego. ↑ ""Mr. Ironman" Jeff Conine Rebounds After Crash". South Florida Adventures. ↑ "Former OF Conine rejoins Marlins". The Sporting News. Associated Press. 2008-12-08. Retrieved 2008-12-10. ↑ "Conine Home Runs with Racquetball". Racquetball Magazine. November–December 1999.